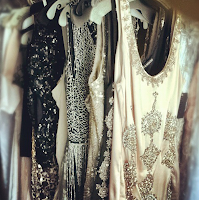 Home / Latest News / GATSBY GIRL: Get Gatsby! 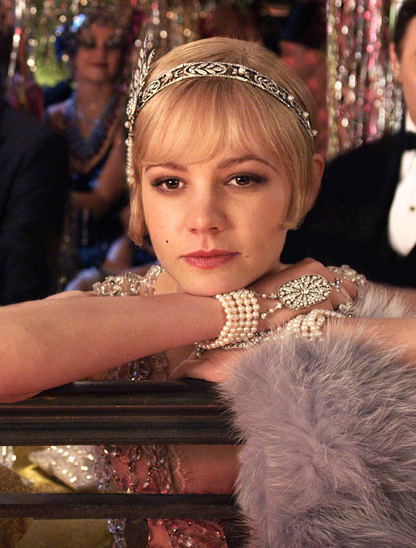 “The Great Gatsby” starring Carey Mulligan and Leo DiCaprio ( release moved to summer 2013) play up to the jazz-age era of stylized-sartorial flair, but this time around, the details may not be so spot on. Sure, the 20’s gave us flappers, and Louis Brooks iconic bob, but this movie slated for Oscar wins, offers a new-take on an old classic. The make up and hair has a modern feel yet stays in contrast with the era but not accurate-obsessed, leaving plenty of leverage to take it to the street. Mulligan who plays Daisy Buchanan gets to flaunt from a plethora of contemporary Prada; 40 dresses from the Prada and Miu Miu archives and for Dicaprio, classic Brooks Brothers tuxedos and suits. A great foundation for face-framing Gatsby waves. Section with a deep side part, adding product with shine to hold waves in place. Mold hair in an S shape with a comb and secure with long pinch clips. Start slow, using more product when needed to sculpture waves, again adding clips to secure. Air dry or blast with hot air to set. If locks are longer, you can do a faux bob. Pin hair under and secure with pins. Keep the front parted and follow the same for waves as explained above. It's a fun look without having to chop a bob - try it for an evening on the town! think old silver-screen Harlow. Start with concealer for a clean canvas. Cheeks are just lightly touched with a rosy color, sweep only on the apple of each cheek. If you are blessed with long arched brows then you are set, but for the rest of us, use pencil and fill in broken areas. Define brows long and sleek.a tonal eye shadow, stay close to skin tone or a bit darker. Coat lashes with black mascara. any lip shade of of red - this is all about color - either deep crimson, wine, berry, rose tones, all tones between. Perfect for the holidays and of-course New Years Eve. Now that you have all the tips and tricks to transform into a "G" girl! That's right, in no time you will be sipping cocktails, blowing kisses and hoofing the two-step in total style!